According to Pantone, the color of 2018 was Ultra Violet, and we saw quite a few bouquets sampling this color and a few of its neighboring shades. There were also some lavenders, indigos, magentas, and fuchsias. 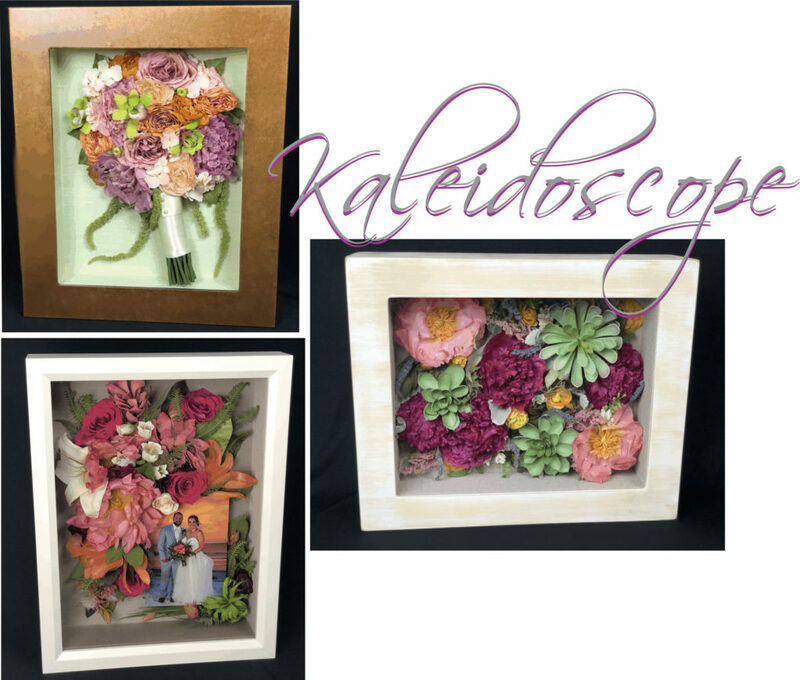 Let’s look back at how some of these colors were incorporated into bridal bouquets over the past year and how they turned out in keepsakes. 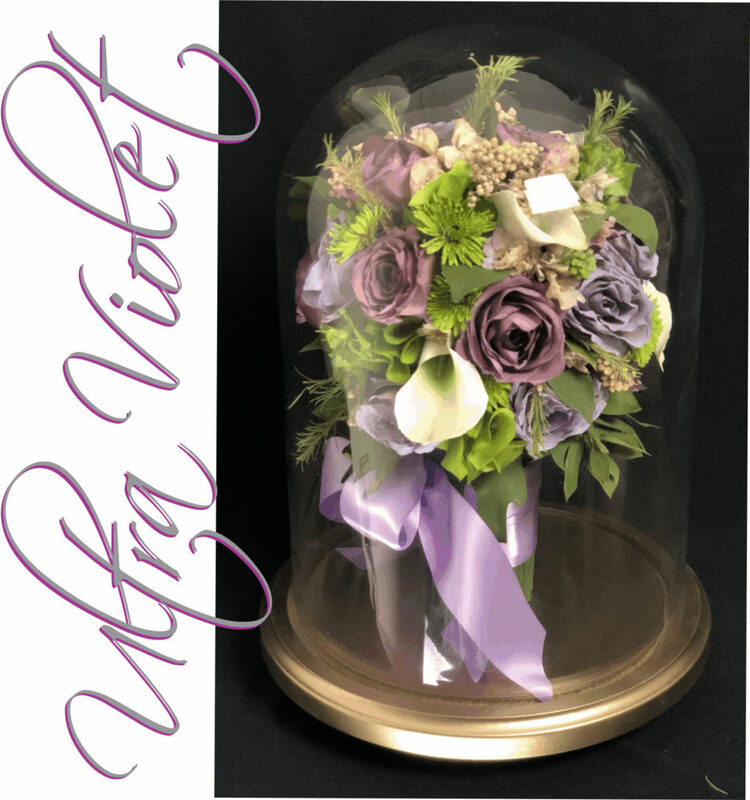 This beautiful table top Keepsake dome exemplifies this Ultra Violet theme, including shades of purple in the roses and even ribbon wrap. And softer lavenders can be seen softly peeking through within the filler flowers. The bright green and darker greens provide a lovely contrast to the Ultra Violet tones in this resemblance of a hand-tied bouquet. The first and easiest color trend that displays the ultra violet movement is the Crescendo. With a soft transition into the stronger and weaker shades of a chosen base color, this trend adds a romantic, almost fantastical element to any event. 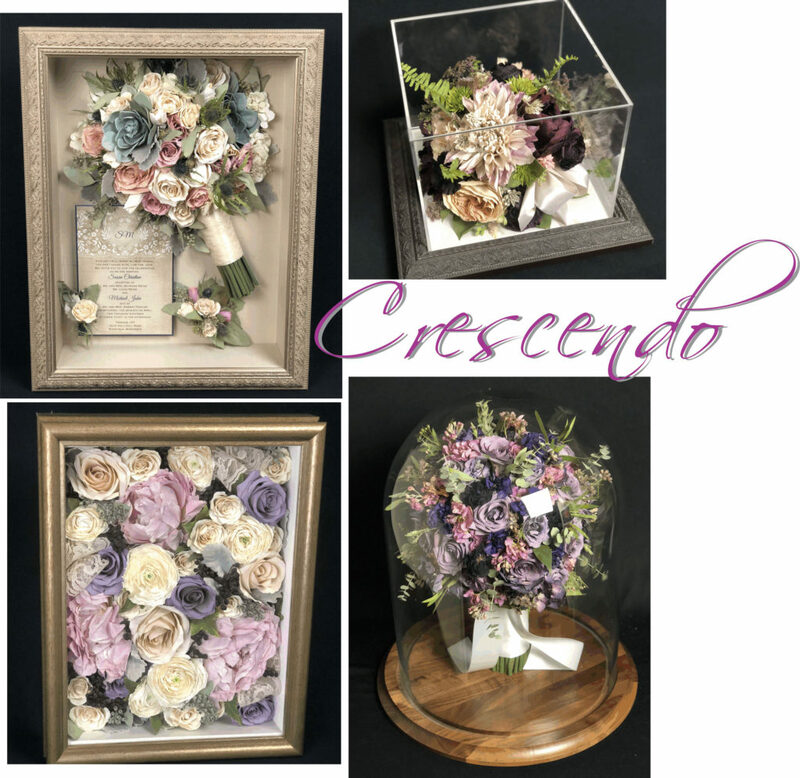 The crescendo trend typically features lavender and blush roses, garden roses, peonies, zinnias, eucalyptus, Persian buttercups, and windflowers. As we view the gorgeous imperial silver shadowbox keepsake pictured upper left, we see the blush roses and garden roses blended transitioning into the blue-violet hints within the thistle and succulents. Eucalyptus is used here to add a soft silver undertone and the keepsake’s framestyle and background beautifully underline the silver undertones of the greenery and invitation as well .. stunning! The upper right table-top cube keepsake beautifully showcases the soft lavender dahlia, moving toward the rich plum blooms behind it. The airy fern and hints of silvery filler finish up this sweet example of the Crescendo. Our warmly-toned burnished champagne shadowbox frame pictured lower left encases a beautiful blanket design of soft lavender peonies, blending darker into the violet-toned ocean song roses and blending the opposite direction into the ivory ranunculus and roses, hints of bridal lace and silvery greenery .. ahhh! And LOVE the grande tabletop dome, pictured lower right, as it exemplifies the up and down tonality stemming from the lavender ocean songs again, as well as the lighter pink-violet lark and darker violet lark, accented with the silvery and airy greenery. Crescendo perfection! The Kaleidoscope trend offers a more vibrant selection rooted in the free spirited 1950’s and 60’s era. Bouquets following this trend tend to exhibit succulents, air plants, hybrid delphinium, hybrid dianthus barbatus, green cymbidium orchids, marigolds, pincushions, hybrid buttercups, tulips, stock, roses, hybrid tea, garden, and spray. The color swatch for this trend favors blues and greens contrasted with tangerine and fuchsia. Upper left in our Kaleidoscope montage, we see the obvious tangerine/lime/pink color scheme, complete with the retro texture of the amaranths flowing down toward the handle and green cymbidiums popping in the center of this textural bouquet. The keepsake below that one exemplifies the tangerine and near-fuchsia, even within the sunset in the bride’s photo! The tangerine lilies and rose-colored protea contrast wonderfully with the lime green air plant in the lower corner. And the bright white frame accents the white lily and buttercup hybrids, also enabling the bride’s white gown to stand out against the soft dove grey silk background. At right, enter a sweet, smaller sized keepsake that almost perfectly showcases this vibrant Kaleidoscope palette and personality .. green succulents, textural peonies with the bright yellow centers, a touch of lavender, pops of violet-plum .. wow! Finally, a more countrified hospitality and autumnal coziness appears with the Wildroot trend. The colors range from soft to bright with lavender, gray flannel, radish red, salmon, and ochre, but also implement handcrafted items, reclaimed wood, and textured fabrics. This bouquet selection commonly features protea, banksia, conebush, garden rose ‘quarter coeurs,’ ‘garden’ flowers, ‘field-grown’ flowers, ‘wildflowers’ and filler flowers like ornamental grasses, berries, berried branches, and gray-toned foliage. The keepsake on top of our Wildroot montage exemplifies the countrified wood feel in its weathered coffee shadowbox, yet includes the soft gray flannel accent in its matboard inlay. The blooms within this bouquet hit this radish, salmon and ochre tones, as the boutonniere wrap includes the Wildroot-prescribed textured fabric. At lower left, we see the grey flannel tone within the keepsake’s background selection, a touch of our Ultra Violet within the rich and textured ribboning, and touches of the reddish tones in the wildflowers tucked between the softness of the pinkish garden roses. And how elegantly the natural ferns blend with the printed fern on the invitation. Texture, rich color and the soft elegant silvery wood imperial ebony shadowbox frame .. Wildroot perfection! 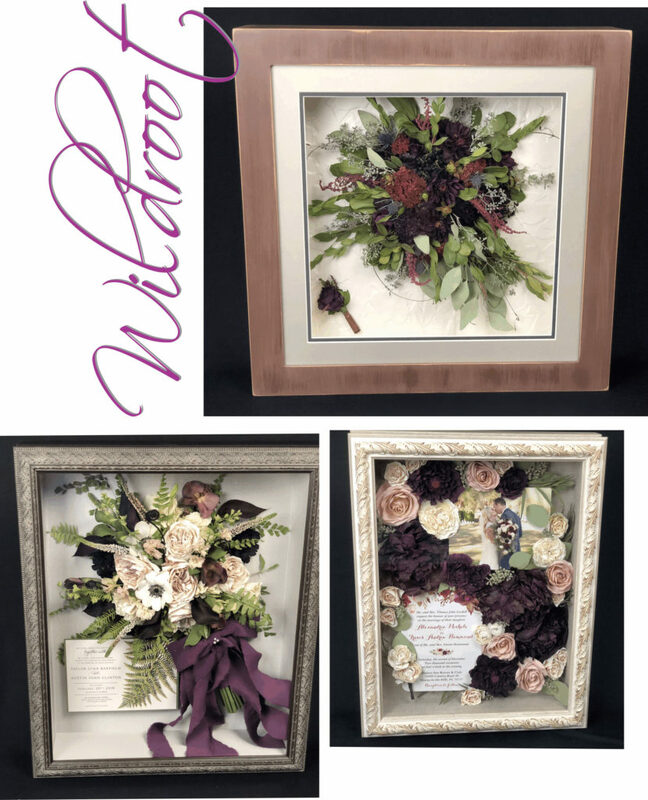 Lower left, in our Verona white shadowbox, we see the rich violet again, blending with the violet dahlias and flowers pictured on the invitation. The soft pink roses blend gradually with the ivory ranunculus and spray roses, and the transition from white to silvery green eucalyptus is picked up with the soft grey background and punctuated with the rustic finishing in the ivory framing. Wow! Overall we think the color trends of 2018 caught the wild and whimsical side of many of our clients, and they turned into lovely keepsakes for everyone to remember their fantastically special day. We can’t wait to see what 2019 colors bring! Let’s bring your colors to life in 2019 by placing a deposit!